Saturday starts here, Craftwork Anniversaire 2016, a quiet day, I went to the park to watch the first game of the football season, should have taken sun cream. so I settle in with a fine beer and a jolly good listening to of some fine music. A simple 500ml bottle of a beer, at 6.5% ABV, which is about 105 calories a serve size, and in NZ that’s 2.5 standard drinks in NZ. 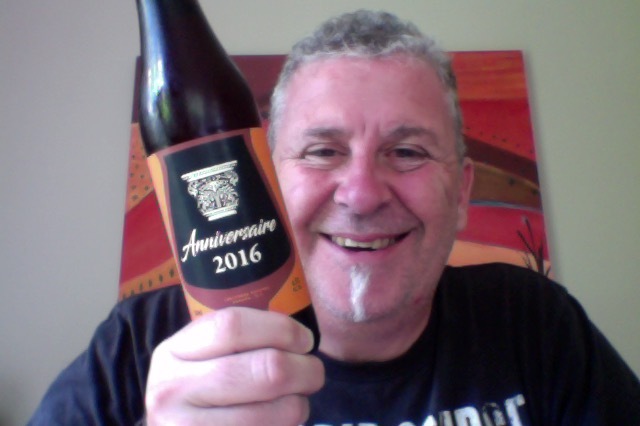 Bottled on 05 September 2016- batch #1 and they say its good in the bottle for 5 years, or in my case this afternoon. A tart and fruity Red brett saison, aged in a Waitaki Pinot Noir barrel on our own Redcurrants for 6 months this super-sour has a highly appealing musty, fruity, furry nose. .. “a really nice balance of sour and malt in the mid palate”. Bright and biscuity, with a layer of dried citrus peel and superb length of flavour..
Take lid off, bed to take goodly whiff of beer, get nose full of over excited foam that came forth. The aroma though sour, cider-like like you’d expect. Bright red pour into the glass with a nice orange tinge head that started big and fell back to something more manageable but smallish. It really looks nice in the glass. Aroma is more red-wine tannin which is, again, to be expected. Well now. Wow would be a way to start talking about this. It is very tart, but not sour, in a puckering way, if that makes sense. There is a firm middle of fruit and it lingers on the tongue and in the mouth, and you can’t help but smile a bit as this is rather good. It is such easy drinking, that tartness refreshes and keeps your taste buds alive and on alert, it’s not quite addictive or moorish, but there is urgent anticipation in this. The pdubyah-o-meter rates this as 9 of its things from the thing. This is jut superb and brilliant beerwork is this. Loves it from that lovely aroma to the last sup of the glass, and all that happened in a thrice that I sat and wondered where it’d all gone. Sometimes just the one isn’t enough and this is one of those sometimes. Where did I get it? Liquorland have them. Would I share with a friend on a porch and set the world to rights? Without a doubt this is a beer that should tick off a lot of boxes to anyone that appreciates a beer for aroma, looks and then the taste and palate. I profess not to like sour beers but this would be one that I’d be happy to front with without a qualm. …Since reinventing himself as a Twitter banter lord a few years ago, James Blunt has proved he can do more than just mewl about pretty women.. 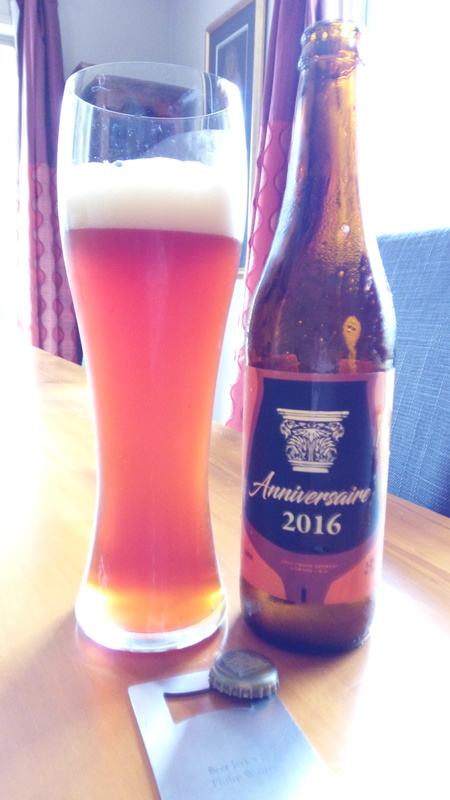 This entry was posted on April 1, 2017 by Philip Walter in Beer, Beer of New Zealand, Beer Review, Craft Beer, craftwork, Critic, Justsaying, Saison and tagged Alcohol by volume, Anniversaire 2016, Beer, craft beer, Craftwork Anniversaire 2016, Craftwork Beer, James Blunt, Saison.